In addition to identification and classification of intervertebral disc pathology, neural impingement and listhesis, vertebral body endplate changes should be given consideration by health care practitioners. Endplate disruption (Schmorl’s nodes/nodules) is easily seen on plain radiographs and CT is sensitive for detection of endplate sclerosis. However, other associated vertebral body changes can only be visualised with MRI. Degenerative vertebral endplate and subchondral bone marrow changes were first noted on MRI in 1987 by de Roos A, et al. A formal classification was subsequently provided in 1988 by Modic T, et al. Type 3 – subchondral sclerosis. The precise relationship between these vertebral endplate changes and lower back pain remains unclear. It is thought that type 1 is symptomatic, whereas type 2 and 3 are not. Shedding more light recently, is an interesting 10 year cohort study of twins. Maatta J, et al won an International Society for the Study of the Lumbar Spine prize this year for their research. In middle-aged women, they considered Modic change to be an independent risk factor for episodes of severe and disabling LBP. There has also been suggestion that Modic type 1 change may indicate presence of discitis/osteomyelitis. Thus, microbial screening may be indicated for patients with type 1 change whose symptoms are failing to resolve as expected with customised conservative (functional/rehabilitation) care strategies. Regarding the sensitivity of different types of MRI scanners to detect Modic changes, Bendix T, et al found that low-field (0.25T) MRI is more sensitive at detecting Modic type 1 changes, while 1.5T high-field scanners more readily identified type 2 changes. Ms M, a 46 year old former aged carer was referred by her health care practitioner for a lumbar spine MRI study. This included a standing component to gauge potential changes in pathology compared with the supine posture. Symptoms consisted of intermittent lower back and bilateral thigh pain over a 12 year period, following manual handling of a large client. Particular aggravating factors included trunk flexion, while temporary relief was obtained with rest and stretching exercises. Mild L4/L5 central canal stenosis secondary to degenerative, unstable, retrolisthesis. Small midline L2/L3 and L5/S1 annular fissures but no focal disc protrusion at these levels. Small left posterolateral L3/L4 focal disc protrusion with L3 root impingement. Prominent L4/L5 Modic Type I changes. This example highlights the challenge when several potential pain generators exist. The challenge for health care practitioners is to make informed decisions in order to help their patients navigate the management process. Of course, diagnostic imaging is not required for every patient who presents for health care practitioner assistance. Furthermore, patients are best served when their practitioners consider a range of potential pain mechanisms. When imaging is indicated and an informed clinical question has been arrived at, after a thorough case work up, the most appropriate imaging modality or modalities can then be utilised to increase clinical clarity. If we can be of assistance with lumbar spine imaging, contact us on 03 9592 3319.
 de Roos A, et al. 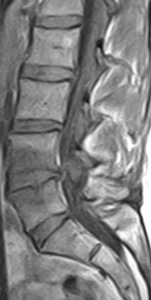 MR imaging of marrow changes adjacent to endplates in degenerative lumbar disk disease. AJR Am J Roentgenol 1987;149(3):531–534. Modic M, et al. Degenerative disk disease: Assessment of changes in vertebral body marrow with MR imaging. Radiology 1988;166: 193–199. Maatta J, et al. ISSLS Prize Winner: Vertebral endplate (Modic) change is an independent risk factor for episodes of severe and disabling low back pain. Spine 2015;40(15):1187-1193. Albert H, et al. Does nuclear tissue infected with bacteria following disc herniations lead to Modic changes in the adjacent vertebrae? Eur Spine J 2013;22(4):690–696. Bendix T, et al. Lumbar Modic changes – a comparison between findings at low- and high-field magnetic resonance imaging. Spine 2012;37(20):1759-1762. This entry was posted in Case Studies and tagged MRI lumbar spine on November 19, 2015 by admin.